More simuldubs! This is our review of the first two simuldubbed (simul-dubbed?) episodes of Seraph of the End. MASSIVE SPOILER ALERT! Our retrospective and dub review of Yuki Yuna Is A Hero aka Yuuki Yuuna Wa Yuusha De Aru aka YuYuYu aka one of the awesomest magical girl shows ever continues! It's time for episode 2, and Togo is at the center of it for reasons both good and bad. e069: Deep Dish Digimon? The Secret Meetings of the Digilluminati! Dave, Carlos, Kiki, and Po return for fun podcast times. 0:00:00 - Po brings us a gripping narrative crossing over Babar and Trigun. Seriously, this needs to be heard to be believed. 0:28:14 - Voicemails from Meowth (http://twitter.com/meowth900) about political mascots, Sailor Moon, spoilers, Splatoon, Digimon, and tips for beating the heat. It's simuldub time! We catch episode 1 of Blood Blockade Battlefront, a title Carlos can't seem to pronounce properly to save his life. -- SPOILER ALERT for Mad Max Fury Road. -- Carlos and Dave saw the amazing Mad Max Fury Road, and now they gonna rave about it! Hello everyone! Carlos here, from the award-winning  podcast Two Fat Guys Talk and Time magazine's "most influential new video series of our time" [again this is going to require a freakin' citation] Carlos and Dave Anime Rave. I'm the loud over-talkative one that hates everything you love. 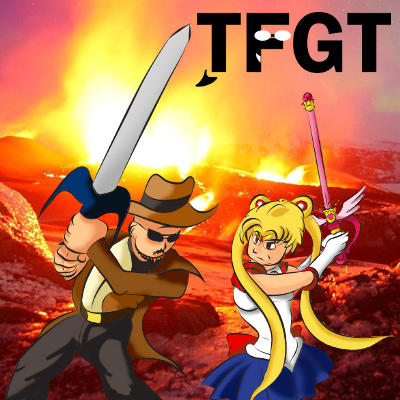 I want to talk a bit about Two Fat Guys Talk (TFGT, the bestest most awesomest abbreviation ever) and the Carlos and Dave Anime Rave (CDAR, possibly a better abbreviation). Specifically, our plans, the status of specific projects, and so on in that fashion until some semblance of an informative post takes shape. Here goes. Right now, I'm in between day jobs, which means I should have tons of time to edit and put out new content (I do the editing and publishing), but I don't. It's a combination of many things: looking for new work, working on my spec scripts and manuscripts (there's a reason I blow a lot of hot air about any sort of fiction), familial/social obligations, and actually spending some time consuming the very entertainment I hope to be involved in making someday. That's why you haven't been seeing new content every single day, though I think I've been pretty good at updating every week or so. But the CDAR backlog has grown rather large, and combined with wanting to put out videos on new shows reasonably quickly, I'm tailoring my approach to tackling the work ahead of me. Carlos and Dave finally upload one of their older raves (possibly even their first) that they never got around to actually putting up: Sword Art Online episodes 1 and 2. It starts off strong. Spoiler alert: Dave felt it stayed there, but Carlos did not. Carlos and Dave re-visit a show they've seen in its entirety in Yuki Yuna Is A Hero, aka Yuuki Yuuna Wa Yuusha De Aru, aka YuYuYu. This is both a retrospective and a review of the dub, which we haven't yet experienced. MASSIVE SPOILERS FOR THE WHOLE SERIES, though, so watch with care! We saw the newest trailer for Digimon Tri, and here are our impressions! e068: Sixty-Eight? The Sixty-Eighth Episode of the Podcast! Today Carlos and Dave work without an outline and talk about various, um, things. 0:02:30 - Mighty No. 9 demo impressions. 0:09:20 - Elder Scrolls 6: Valenwood talk. Just how is that pesky word pronounced? 0:14:33 - Does Mortal Kombat really need Fatalities to stay relevant and cool and hype and whatnot? We talk about this for quite a bit, including crossover implications. Also assorted fighting game topics for conversation. 0:41:43 - E3 2015 conference predictions! 0:49:56 - What’s a podcast without voicemails from Meowth (http://twitter.com/meowth900)? Not much of a podcast I’d say! She talks about anime/manga, Gravity Falls, Steven Universe, school assignments, Mario Kart DLC, Patreon, and a bunch more.